Xcel's Ponnequin Wind Farm on the Colorado-Wyoming border. The wind farm helped the utiltiy produce 57% of its power from wind one night this spring - a U.S. record. NEW YORK (CNNMoney) -- During the early morning hours of April 15, with a steady breeze blowing down Colorado's Front Range, the state's biggest utility set a U.S. record -- nearly 57% of the electricity being generated was coming from wind power. As dawn came and the 1.4 million customers in Xcel Energy's service district began turning on the lights, toasters and other appliances, the utility's coal and natural gas-fired power plants ramped up production and brought wind's contribution back closer to its 2012 average of 17%. Utilities have long been wary of placing too much finicky renewable power on the grid. "A lot of utilities don't want to contract large amounts of wind because it's volatile," said Amy Grace, a wind analyst at Bloomberg New Energy Finance. "Anything over 25%, and utilities get nervous." Colorado's overnight high-water mark demonstrated that utilities can indeed incorporate cleaner power sources into the mix. It also provides hope that, under the right conditions and policies, wind will be able to provide a significantly larger share of the nation's power than its current 3% rate. "It certainly can be replicated, as long as you have a robust, diverse grid," said Elizabeth Salerno, head of data and analysis at the American Wind Energy Association. "Other folks have some catching up to do." One thing that helped Xcel (XEL, Fortune 500) reach such a high number was geography. Colorado is a windy state -- although it's not the windiest. If the wind begins to blow too hard, which can threaten the turbines, the software will automatically feather the blades, slowing them down, and direct the coal or natural gas plants to increase their output. When the wind dies down, the software can more seamlessly ramp up power from fossil plants. 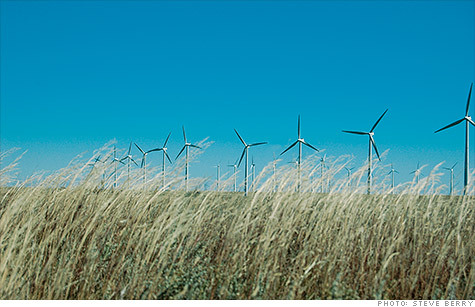 "The wind is a free fuel resource," said Drake Bartlett, a trading analyst at Xcel. "We want to try to take that as much as possible." The fuel for wind turbines may be free, but the turbines themselves are expensive. Without any subsidies, new wind power is nearly twice as expensive as the current low-cost choice -- natural gas -- on a national average basis, according to numbers provided by New Energy Finance, though the cost for wind can vary widely by region. To help wind compete, the federal government has been providing a tax credit that amounts to roughly 30% of its costs. That credit is set to expire at the end of this year and has yet to be renewed. About half the states have gone one step further, requiring utilities to purchase a certain percent of their power from renewable resources. Colorado has ordered its utilities to buy 30% of their power from renewable resources by 2020. That's one of the highest standards in the nation, and certainly has helped Xcel reach such high wind generation numbers. The strategy appears to be working -- AWEA said the costs for turbines has decreased 33% over the last three years. New Energy Finance's Grace said wind should be cost competitive nationwide in two or three years. Critics say the renewable industry has been promising this since the 1970s, and has yet to deliver.